Our Pure White paper is quite a lot brighter than it appears in this picture. It’s acid free and the dazzling whiteness is achieved without the use of any nasty chlorine bleach. The subtle felt finish letterpress prints smoothly. 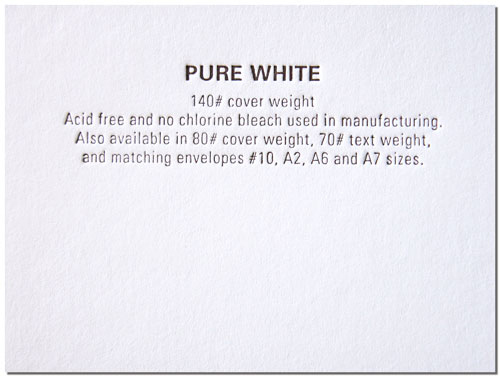 Available in 140# and 80# cover weights, 70# text weight, and matching envelopes #10, A2, A6 and A7 sizes. 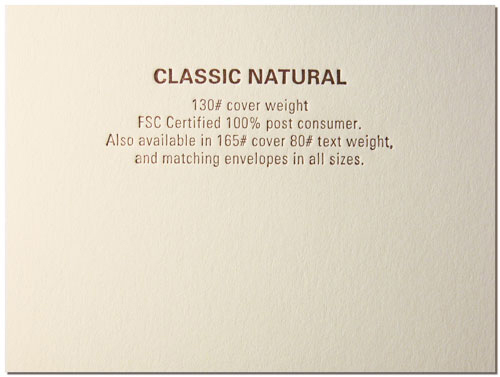 Our Classic Natural paper is a lovely cream color, and is actually warmer and lighter than it appears on a damn computer screen. Made of FSC Certified 100% post consumer waste. It’s smooth surface prints very nicely indeed. 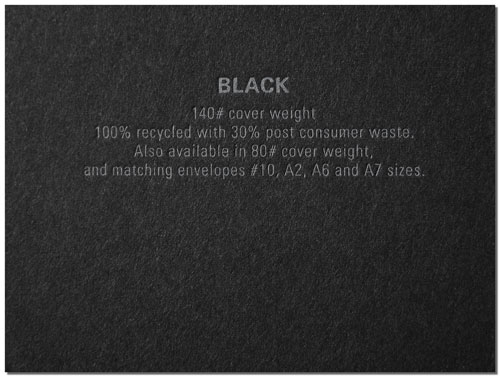 Available in 165# and 130# cover weights, 80# text weight, and matching envelopes in nearly all sizes. Our 100% Recycled stock is made entirely of de-inked post consumer waste. A lot of old crap goes into this good looking paper. Pale warm gray in color with visible recycled fibers. Has a slight surface texture but prints reasonably smoothly. 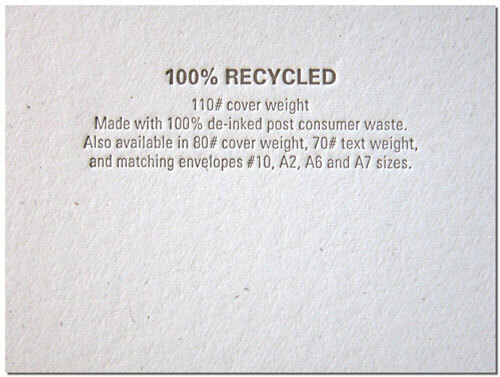 Available in 110# and 80# cover weights, 70# text weight, and matching envelopes #10, A2, A6 and A7 sizes. Our house Black paper is somewhat smooth but pretty dark in color. Please understand that letterpress inks are fairly translucent so most ink colors just won’t work on black stock. Don’t even ask. Metallic silver or gold ink however are the most opaque and what you usually see used on black stock. They do not look very metallic-like on the uncoated paper. Silver looks more like a medium gray with a slight shimmer if you wiggle it under a light. That said though, metallic inks will give you an interesting letterpress piece if that is the look you are after. Other than metallics, another ink color that works on black stock is black. It will give you a dandy look but is on the moodier side as you can imagine. If you want a color on black stock other than those mentioned above, foil stamping is probably the way to go. We can do that for you but you will be limited to available foil material colors. Available in 140# and 80# cover weights, and matching envelopes #10, A2, A6 and A7 sizes. 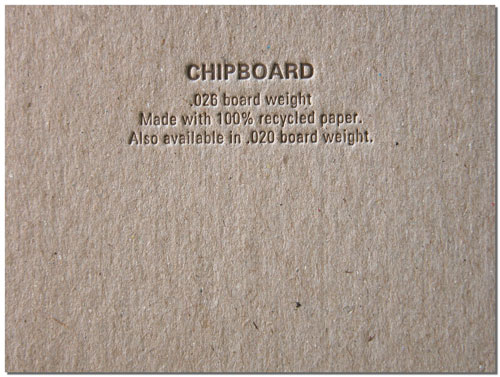 Our Chipboard stock is exactly as advertised. Unattractive and industrial on its own, but comes to life in a designer’s hands. Be warned though, its rougher surface doesn’t print perfectly smoothly. That’s half the attraction. Made with 100% recycled paper. Available in .026 and .020 board weights.